The establishment of protocols requires liaison between government veterinarians in both countries. 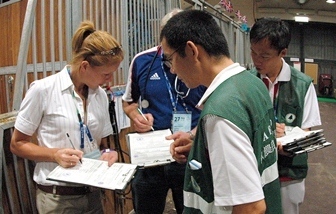 For international events there are several protocols to be agreed between the host country and the participating countries. Subsequent to agreement to the protocol the horse must meet the stipulated health requirements prior to travel. As the Official Transport Provider Peden will take on the responsibility of negotiating such protocols on behalf of the Organising Committee. Peden will liaise with field veterinarians (private and Ministry) as well as the laboratories to ensure that all horses are fully prepared for travel in regard to sampling, vaccination, quarantine, residency and certification. Peden will also undertake the lead liaison with other Regulatory Bodies. For example to permit Feed and Veterinary Medicines to be imported many legislative requirements must be understood and overcome. Peden will lead on these discussions and ensure that the relevant certification accompanies the imported material. Additionally Veterinarians & Farriers must be licensed to practise Veterinary Medicine and Farriery in the country hosting the competition. Peden will undertake liaison with Regulatory Bodies in the host country and with the Team veterinarians & Farriers to ensure that the registration process is complete and that the horses have the services of their own medical team throughout their stay at the Competition.